mdi - Manufacturers Distributor, Inc. The mdi Sales Team is standing by to help you with your order or questions about the Weg Product Line. Give mdi a Call Today! We are available via phone Monday - Friday, 7:30 AM to 5:30 PM EST. Call 727-835-0663 or Email, we'd love to help! 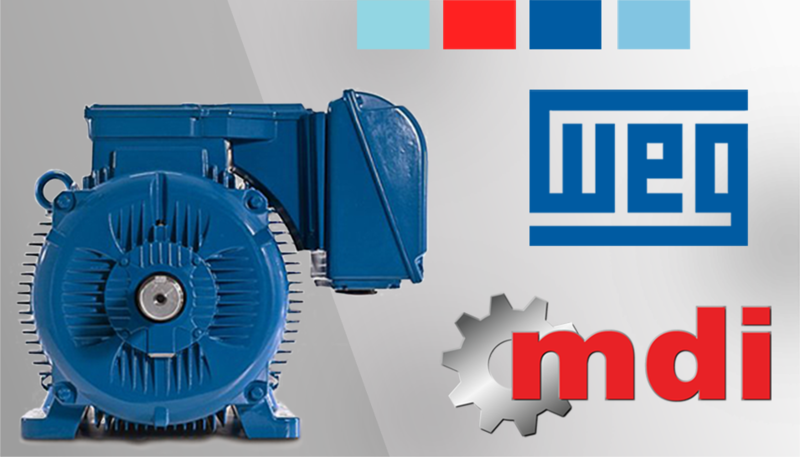 Success has always been a part of the WEG Motors history, which is why we at Manufacturers Distributor, Inc. are proud to be an authorized distributor of WEG Electric Motors. As one of the world's largest electric motor manufacturers, WEG specializes in branches such as command and protection, speed variation, industrial process automation, power generation and distribution and industrial paints and varnishes. When it comes to the tools of your trade, you demand quality, value and availability. WEG Motor Sales is proud to be able to deliver a high level of customer service along with a wide range of WEG Motors. WEGMotorSales.com is designed and built with your needs and application in mind. WEGMotorSales.com is owned and operated by Manufacturers Distributor, Inc.; mdi exists to help you with the selection and purchase of your WEG motor products. Uni-body construction - Greater strength and no "hot spots"
All frames ESSO/EXXON POLYREX EM - blue color and is a polyurea based grease (achieved a lubrication life of more than 700 hours at 177ºC (350ºF)). Other special greases available upon request. Check out the Downloads Page for catalogs and technical data. WEG is a registered trademark of WEG Industries.